The story of a man who was a giant among men. He began life with few endowments. He had neither riches nor influence, yet built and maintained what was the most successful milling enterprise in the world; and was equally at home teaching children Sunday School. Why? Simply because all knew they could trust him. His life can be summed up in a few words - thrift, hard work, humanity, honesty, fidelity and a deep religious faith. A man who discovered that he enjoyed giving away, more than making money. 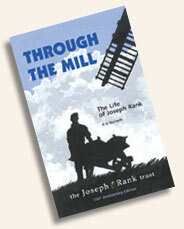 JOSEPH RANK’S last visit to Hull was overshadowed by tragedy. Those who stood beside him as he gazed upon the ruin of the mills he had built in his prime were deeply aware of it. So, no doubt, was he. But he gave no sign. He was always at his best when facing difficulty. The Clarence Mills, his first great achievement and the symbol of his life’s work, had been destroyed by German bombs. True, the high stacks and the lofty outer walls still stood beside the murky river, but they were no more than a gaunt and broken shell. Where the heavy rollers had ground the grain, where the mighty engines had throbbed night and day, all was silent as a tomb. Some men would have looked upon it as a tomb, the final grave of valiant and high-hearted enterprise. As Joseph Rank looked at those blackened walls, a man far in the eighth decade of his life, only a few months from its end, his mind must have returned to the days when he first planned these mills. It was his boldest venture. It marked his emergence from the mass of men. It laid the foundations of his fortune, and of many another’s. All that he became, all he was able to do for his countrymen, was there in embryo. The mill became a landmark. It may be said to have done much to establish the commercial prosperity of Hull. It was the apple of his eye. Now - only desolation remained. And he drove away without a backward glance. A full pdf copy of the book can be downloaded here.